The steps down from the Torre della Guardia (Watchtower) to the Punta Carena lighthouse offer breathtaking views. Punta Carena is one of the most popular seaside resorts on the island of Capri, with a unique setting where the sun sets over the sea. 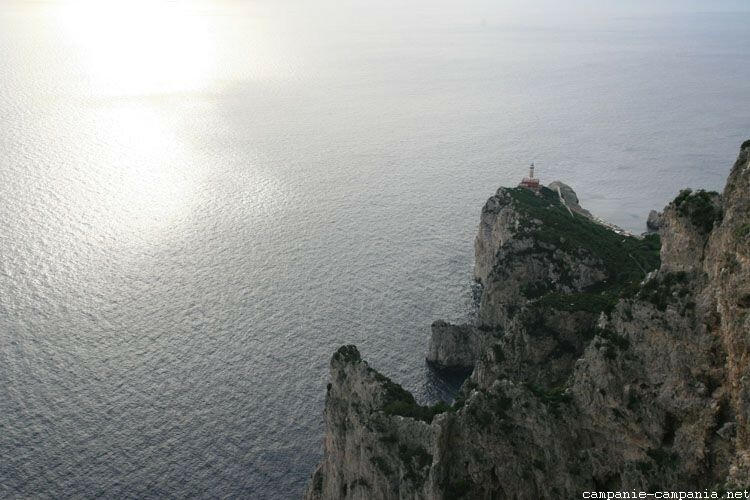 There are several possibilities of walks to reach the Torre della Guardia, then the Punta Carena. It’s the longer route, passing through the Migliera area, with a stop at the belvedere overlooking the Faraglioni. From Anacapri or arriving by bus from Capri (get off at the stop “Il Cimitero”), take the picturesque Via La Migliera that leads to the Belvedere del Tuono after about 2 kilometers, after the “philosophical park”. A short path goes up on the left to a beautiful point of view on the sea and the Faraglioni. From the belvedere, on the right there is a path sometimes a little difficult along the ridge to the Torre della Guardia (1 km). From there some stairs go down towards the Punta Carena, with a brief passage on the road, before cutting through the pine forest and arriving at the lighthouse (less than a kilometer). From the road, it is possible to take a path that leads to Fort Pino. From this path, another leads on the left to the Cannone fort and Cala di Limmo cove. In Migliera, in front of the Philosophical Park is the renowned restaurant Da Gelsomina, which is also a hotel and has a swimming pool open in summer. Arriving by bus from Capri, get off at the terminus of Anacapri, then walk along the Via Nuova del Faro road. After about 300 meters, at the end of a right descent, turn left onto Via Vecchia del Faro. Then turn right onto Via La Guardia and follow this country road. About a kilometer and a half further, one arrives at the Torre della Guardia, an old fort guarding the sea. Near the tower, a stone staircase joins the road to the lighthouse. From the road, it is possible to take a path that leads to Fort Pino. From this path, another leads on the left to the Cannone fort and Cala di Limmo cove. By taking the road to the lighthouse, a path on the right cut through the pine forest to reach the lighthouse 700 meters further. In Punta Carena, there is the beach facility of Lido del Faro and two typical snack bars that offer good sandwiches. Buses to return to Anacapri leave every 20 minutes about. From the terminus you can take a bus to Capri or Marina Grande.